Divorce is almost always a disaster! It affects all those involved for the rest of their lives in ways we can hardly imagine. It is fair to say that no one ever emerges from a divorce unscathed or unaffected. Divorce is an exceedingly stressful event that tends to impact women more so than it does men. The stress involved affects the one who is “left” more than the one who “leaves”. Divorce can impair an individual’s emotional wellbeing for at least five years after the event, producing a greater variety of long lasting negative feelings that even the death of the partner does not produce. Legally, divorce is a single event, but socially, emotionally, and psychologically it is a chain of events, relocations, and radically changed relationships that result in broken families, changed lifestyles, economic hardships and a series of transitions that challenge, disrupt and modify the lives of individuals, promoting growth for some, and exposing personal vulnerability’s for others. While the word divorce implies finality, it needs to be recognized that divorce is a process that begins with a failing marital relationship and lasts long after what is probably the greatest emotional pain an individual will experience in life – the decision to separate and divorce. Divorce radically alters the structure of the family. It creates tense conflicts and divided loyalties. It forces parents to drastically adjust their parenting roles and embroils extended family members in a battle to reaffirm loyalties and realign alliances. The emotional trauma that occurs during the crisis of separation and divorce is enormously disruptive and debilitating. The sense of failure and loss that accompanies the marital breakdown frequently results in feelings of intense disappointment, bitterness, loneliness, dislocation and depression. The feelings of inadequacy and abandonment can be overwhelming.Research suggests that people who divorce constitute much higher risks for both psychiatric and physical disease. The experience of high levels of stress can lower the immune system’s ability to protect the individual from infection and disease. The ongoing conflict and anger between the couple may lead to higher levels of stress and frustration and contribute to a loss of self confidence, lower self esteem and feelings of hurt, resentment, remorse and depression. Judith Wallerstein’s research highlighted the fact that men and women tend to remain intensely angry with the former spouse for many years after the break up (50 per cent of men, and 33 per cent of women were still angry 5-10 years after the divorce). Other research shows that family members continue to engage in escalating cycles of conflict and coercion long after the marriage is over and the family has split up. The breakdown of the marriage relationship inevitably leads to the disintegration and relocation of the family and a “downward mobility” of the family lifestyle with individuals being impacted by the change of economic and social conditions. The parent who has custody of the children (usually the mother) more often than not ends up as a struggling single parent with drastically diminished financial and material resources. The economic degradation that accompanies divorce is frustrating and humiliating for both parties. The re-location of family members also means a change in their social networks of support, and a loss of contact with family and friends which serves only to isolate individuals more, resulting in further hurt, jealousy and anger. Children are the innocent victims of divorce – the real losers (they lose their family, their security, their identity, and their protection). They have no say in a decision that profoundly affects the rest of their lives. As psychiatrist Carl Whittaker says, “When children are involved, there is no such thing as a divorce. The battles over parenting, access, maintenance and custody, don’t end with the legal granting of a divorce. Children end up being innocent bystanders who secretly hope that one day Mom and Dad will reunite and the emptiness they feel will go away.”According to Californian psychologist Judith Wallerstein, children continue to suffer the emotional repercussions 25 years after their parents divorce. She claims that the effect of the divorce is played and replayed throughout the first three decades of the child’s life and that its impact is both long lasting and cumulative. Wallerstein found that the biggest factor affecting the adjustment of children was not the divorce itself, but the psychological health of the parents and their involvement with the children. Plenty of evidence exists to suggest that children from divorced families are put at greater risk for a variety of emotional and behavioral problems including, oppositional or avoidant behaviors, acting out behaviors, aggression, and symptoms of depression, anxiety and low self esteem. Fifty per cent of children enter adulthood as worried, angry, and self depreciating. Both boys and girls have trouble establishing and maintaining love relationships, with close to 40 per cent needing relationship therapy. Daughters of divorce are likely to develop attention-seeking behaviors, be sexually unhappy, anxious and depressed, and feel a profound lack of control over their lives. Sons of divorce take longer to adjust and tend to become more sexually aggressive, exhibit antisocial behaviors, and have more learning difficulties at school. A recent study reported in the Journal of Divorce and Remarriage (Volume 22, 1995) shows that, of those surveyed, only 17 per cent reported a decrease in their spiritual lives due to their divorce. Eighty-three per cent said that the divorce experience had ultimately strengthened their spirituality. This suggests that a significant spiritual vacuum and openness to God exists for those who experience divorce. The study, which included people from a wide range of Protestant and Catholic Churches in the United States, also showed that 42 per cent of people changed their religious affiliation as a result of their divorce, and that the majority of those who had made a change seem to be doing the best spiritually. Thirty-three per cent of women surveyed indicated that their divorce was a catalyst for changing their religious understandings. The way in which the church responds to individuals and couples during the time of their separation and divorce appears to have a significant impact on them and their view of the church as a supportive community. Two separate studies conducted in the South Pacific Division (SPD), and in the North American Division (NAD) have found that 50 per cent of those surveyed dropped out of the church after their divorce. In the SPD study it was found that all these people had left the church within three years of their divorce. In the NAD study, 17 per cent had already quit attending prior to the time of their divorce, and another 17 per cent had stopped attending either at the time of the divorce or during its aftermath. 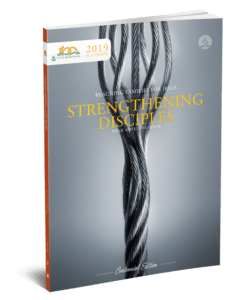 Frequently the local church and its ministry leaders find it difficult to know how they might respond to people who are experiencing marital distress and the break up of their family. Congregations appear to be quickly drawn into “taking sides” or, on the other hand, to see intervention and support as an intrusion into the private lives of the couple and the family. Several studies have shown that one of the most significant factors that seems to influence positive adjustment in divorce is whether or not the church is perceived to be an accepting, supportive and healing community. In 1997, the Adventist Institute of Family Relations in Australia was involved in conducting a qualitative research project among divorced members of the church to understand the nature of their experience in divorce, to assess their attitude towards the church’s policy on divorce and remarriage, and to discover how they felt the church responded to their marital crises. The following responses give some indication of the way in which many individuals surveyed felt about the church’s response to them during their marital crisis. Many of them said they felt unsupported, misunderstood and betrayed, at a time when they were looking to the church for help. The emotional reactions of those surveyed include a variety of feelings that range from rejection and misunderstanding to dismay, disgust and outrage. Several individuals felt a sense of shame that they had let their extended family down, and that they were an embarrassment to the “good name” of the church. Some were obviously distressed at still being able to access their pain and anger when they recalled how they “cried for help,” but no one was there for them. A majority of respondents indicated that this was the first time anyone from the church had bothered to ask them how they had dealt with their divorce. While there are a number of factors that influence the way in which individuals go about resolving the social dislocation and emotional trauma created by separation and divorce, e.g., personality, social skills, level of self esteem and self confidence, ways of handling conflict and stress, ways of perceiving the church, one theme was dominant in the responses of those surveyed. Nearly everyone felt bewildered by the reactions of embarrassment, disapproval, and non-acceptance from church members towards their marital crisis. There was an almost universal sense of profound sadness over what had happened and feelings of disappointment and abandonment that no one seemed to know what to do or how to respond. The way in which the church so often responds to marital crisis seems to have a deep and lasting effect on the individuals involved. When asked to describe what their relationship to the church has been like since their separation and divorce, many indicated that their view of the church had undergone radical change. They typically felt angry about the way people had treated them, cynical and skeptical about the church as an organization, and unsure that they could see themselves continuing to make a substantial contribution to an organization that had essentially shunned them. Some expressed the fact that this treatment felt like a “second injury” – first they had been rejected by their partner, now by their church family. Of further concern is the way in which most described the impact that the church’s response has had on their children. Many found it difficult to express the magnitude of their grief over the way in which their children had become so bitter about and estranged from Christianity – an estrangement that has taken more than a decade for most of them to work through. Interestingly enough, while individuals’ attitudes towards the church may have changed dramatically, so too had their relationship to God. Almost all those interviewed expressed that their relationship to God had become stronger, and that their ability to appreciate and embrace the grace of God had deepened. Some said that they felt more committed, loyal, and willing to trust God because they had discovered that He was always there for them, even though their church family wasn’t. Some had felt pushed towards a more interdenominational stance in their personal spiritual journey, while others clearly found it easier to worship with another congregation, either inside or outside the Adventist community. One of the points of great anguish for several of the people interviewed was that even a decade or more after their divorce and their subsequent remarriage, they had still not been offered a single church office in their local congregation. This had further contributed to their feelings of exclusion, low self-esteem and non-acceptance. A variety of responses were received from individuals when asked the question, “What reaction did you get from the church when you requested permission to remarry and maintain your membership within the church”. Most were highly offended by the process to which they were subjected the church. Some were still clearly upset over the sense of intrusiveness and the invasion of their privacy by the church board or conference committee that sought to reopen all the issues surrounding the breakdown of the marriage, and their separation and divorce in order to come to a decision. This process was described as “humiliating”, “intimidating”, “impersonal”. Many felt that doubt and suspicion was once again cast upon them as an individual as the church sought to establish “guilt” and assign “blame”. Individuals said they felt “pressured and grilled” to come up with the evidence. One person said he was reluctant to embarrass his ex-wife and felt himself embarrassed and humiliated by the whole process. He felt that the whole situation was handled and resolved politically rather then personally. Others were angry over the fact that it took so long (in one case two years) for a “verdict” to be handed down. Still others were frustrated and incensed over the fact the path to resolution was “so foggy and unclear”. It was acknowledged by quite a number of respondents that the conference administration seemed quite awkward and embarrassed over the whole process and that they were relieved when they could find clear evidence that a “guilty partner” provided the biblical grounds to approve remarriage. Hart, A. (1989). Children and divorce . Dallas, TX: Word Inc. Publishers. Hartin, W. (1977). Divorce dilemma . Melbourne, Australia: Hill of Content Publishing Company. Kaslow, F., & Schwartz, L. (1987). The Dynamics of divorce . New York: Brunner/Mazel Inc. Publishers. McKay, Rogers, Blades, & Gosse (1984). The divorce book . Oakland, CA: New Harbingers Publications. Sahlin, M., & Sahlin, N. (1997). A new generation of Adventist families . Portland, OR: Centre for Creative Ministry. Schwartz, L. (1992). Children’s perception of divorce. American Journal of Family Therapy 20 , (4). Volgy, S. (1991). Women and divorce/men and divorce – gender differences in separation, divorce and remarriage . London: Haworth Press Inc.
Wallerstein, J., & Blakelee, S. (1990). Second chances . London: Corgi Books. Wegscheider-Cruse, S. (1994). Life after divorce . Deerfield, FL: Health Communications Inc.
Weiss, R. (1975). Marital separation . New York: Basic Books Inc. Publishers. When he prepared this paper for the General Conference Divorce and Remarriage Study Commission, Bryan Craig was the Director of Family Ministries for the South Pacific Division.